In Cumbria, Signs of Safety is about more children and young people remaining with families when the families have the potential to care for them safely. 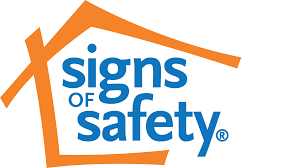 Signs of Safety is an innovative strengths-based, safety-organised approach to child protection casework. The approach focuses on the question "How can the worker build partnerships with parents and children in situations of suspected or substantiated child abuse and still deal rigorously with the maltreatment issues?" This strengths-based and safety-focused approach to child protection work is grounded in partnership and collaboration with families and other professionals. It expands the investigation of risk to encompass strengths and Signs of Safety that can be built upon to stabilise and strengthen a child's and family's situation. By utilising a questioning approach rooted in Solution Focused Brief Therapy, the family are at the heart of all decision making and are empowered to make positive choices about their own lives. With this in mind the LSCB is holding events around the County led by Cumbria’s Signs of Safety leads.